Inside Storey: Sherri Brooks Vinton: Yes, You Can Can (and Cook, Too)! Sherri Brooks Vinton: Yes, You Can Can (and Cook, Too)! “Aren’t you afraid you’ll kill somebody?” It’s often the first question I’m asked when I tell someone that I preserve my own food at home. I assure them that I won’t be taking the life of my nearest and dearest by feeding them. They just chuckle and shake their head and mutter some remark about my bravery or their ineptitude or a combination of both. I understand. Canning is a craft that, until recently, had fallen quite far out of favor with home cooks, and I’m sure this unfamiliarity, coupled with the few pieces of task-specific equipment it requires, can make the process seem one of the “dark arts.” But I also think these culinary willies point toward something bigger regarding home cooking—that all things “kitchen” are difficult and scary and you need a chef’s coat to have any success there. Over the last 40 years, food marketers have done a very good job of scaring us away from our own hearths by making them seem impossibly intimidating or at least an undesirable and déclassé place to spend time (unless “spending time in the kitchen” means eating takeout at your imported granite island while admiring your reflection in your six-burner Garland cooktop, but that’s a rant for another time). Maybe you’ve heard this joke? It reflects the mentality that the smart person, the accomplished family, does not dirty hands with the toil of cookery. Imagine if we applied the same thought process to clothing. Teacher: Mrs. Jones, Johnny showed up at school again today in a trash bag. Ms. Jones: Well, I’m not into fashion, so I don’t do that whole “clothes” thing. Cooking food for one’s family is just as basic a necessity as putting clothes on their backs. You don’t have to know the difference between Calvin and Karan to throw on a pair of jeans and a T-shirt. Equally, you don’t need to sport a chef’s toque to toss a salad, scramble an egg, and call it dinner. Not that dinner needs to be a mad dash into and out of the kitchen, but there are many meals that can be cooked—from start to finish and using nothing processed—in no time at all. And home food preservation? 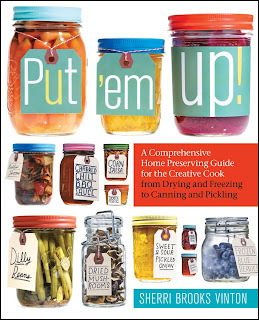 If you can boil water, you can be putting up all your own jams, jellies, tomatoes, and gorgeous summer fruits. You can start right now with no special training and just a few inexpensive items (namely tongs and jars) that you can pick up at the grocery or your local hardware store. It’s time to chase away the voices in your head that say you can’t cook, and there’s nothing like the rattle of pots and pans to send them fleeing. Sherri Brooks Vinton is the founder of FarmFriendly LLC, which helps eaters, restaurateurs, and organizations support local agriculture. She is a former governor of Slow Food USA and a member of the Chef’s Collaborative, Women Chefs and Restaurateurs, the Northeast Organic Farming Association, and the International Association of Culinary Professionals. She is the author of Put ’em Up! and The Real Food Revival and lives in Easton, Connecticut. Her website is sherribrooksvinton.com.